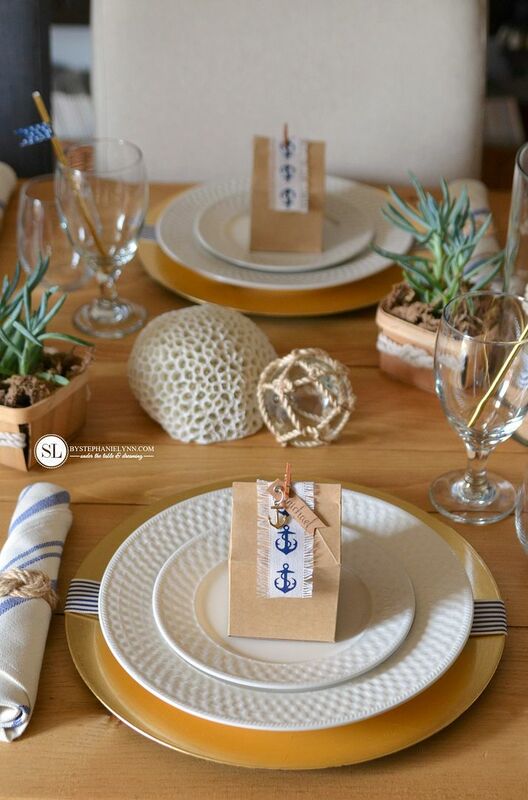 Nautical Table Setting | DIY Beach Themed Tablescape – Bring your next event together with color and style and create a festive mood with a themed table setting. 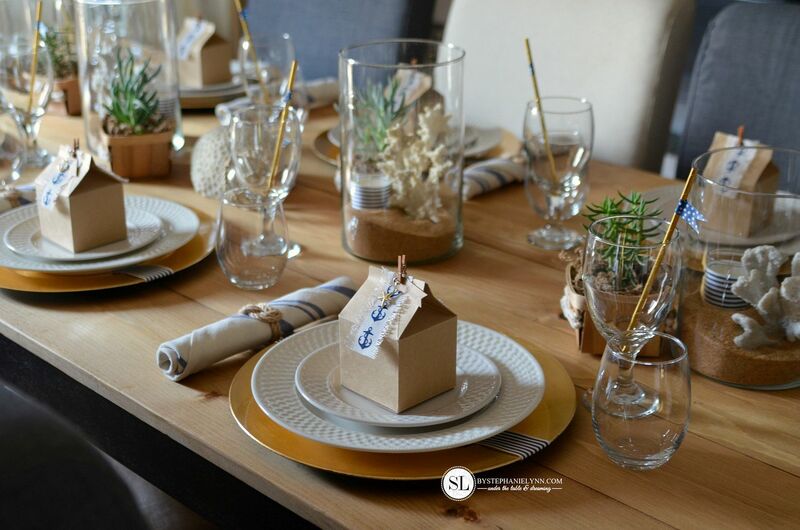 One of my favorite parts of planning a dinner party is creating a charming tablescape. 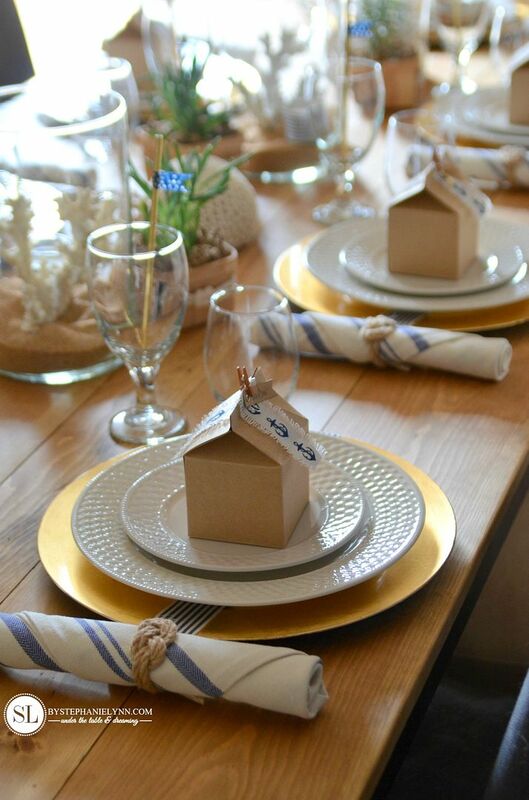 Investing a little bit of time and thought into the table setting can transform even the simplest of meals into a memorable experience for your guests. 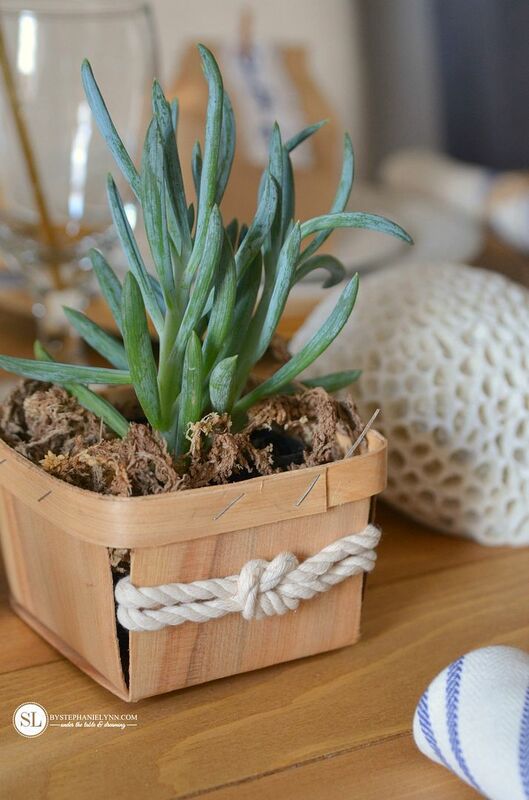 Recollections™ Craft It™ line from Michaels. 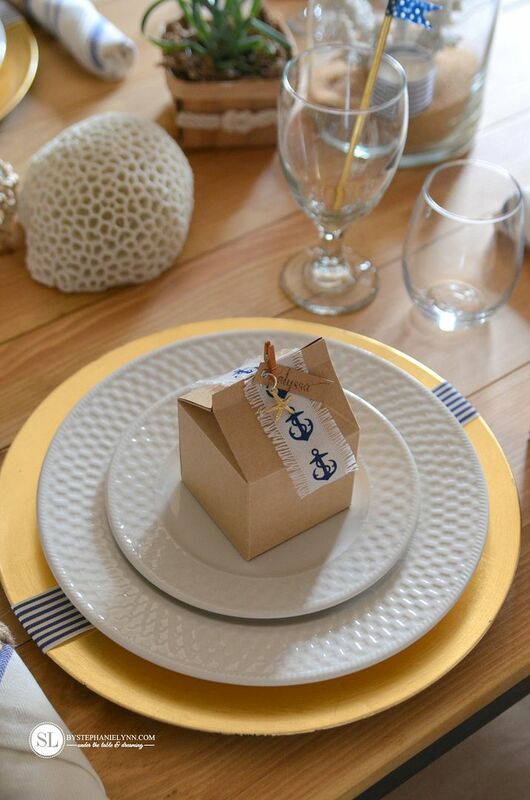 An assortment of paper crafting pieces from the line were incorporated into some simple DIY ideas below, that can be used to decorate and personalize any event or celebration. Gold Plate Charger, which was dressed up with a strip of Navy Striped Ribbon. 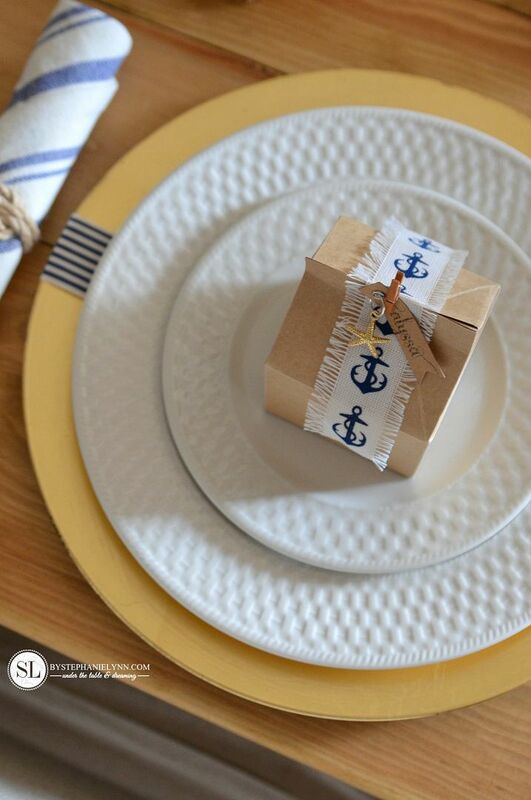 Using ribbon is an easy way to bring pattern and color to place setting without any permanent commitments. The ribbon was simply cut to length and each end was hot glued to the back of the charger. 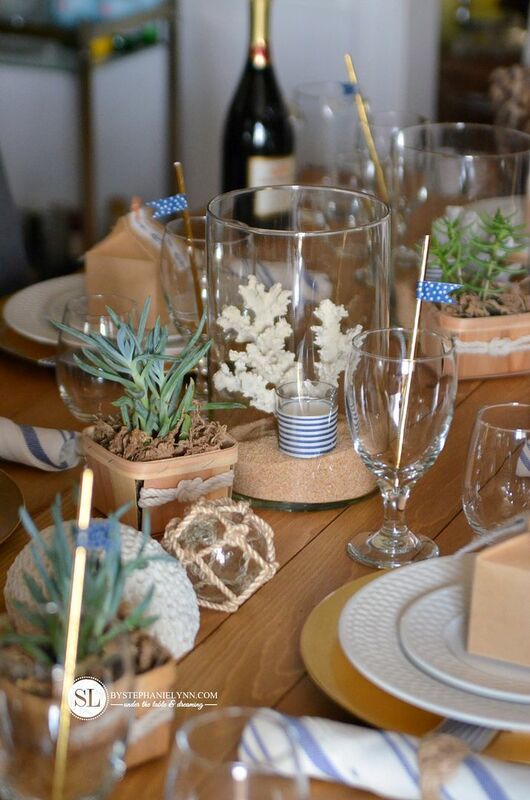 The hot glue can easily be removed once your dinner party is complete. and also doubled as favors for each guest to take home. They can filled with an assortment of candies or chocolates and are a great way to surprise each guest with a small trinket, reminiscent of the party. 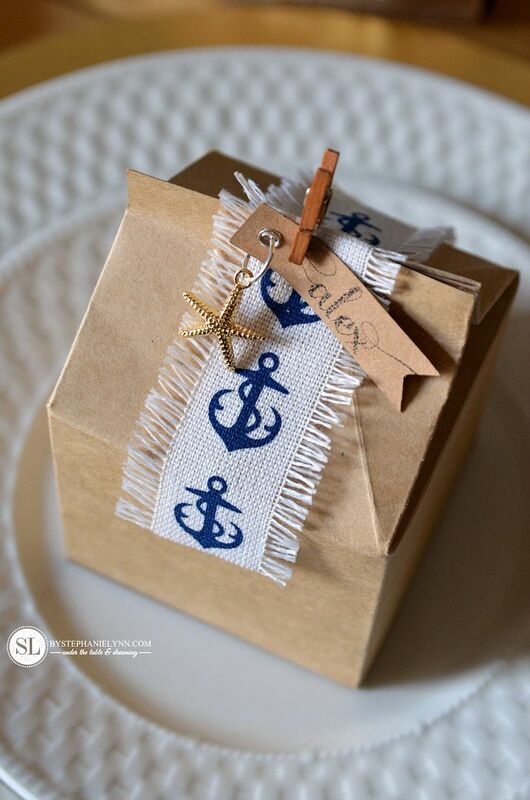 The cartons were adorned with a piece of Blue Anchor Ribbon to tie them into the Nautical theme. 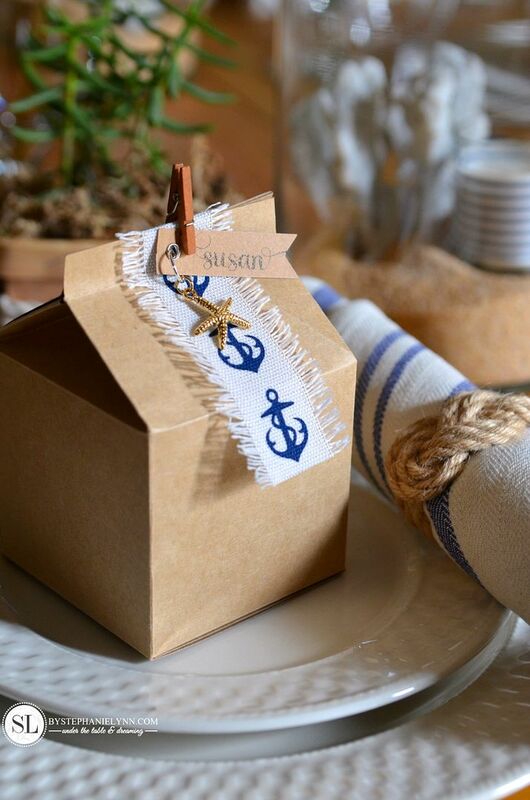 Each guests name was written on Kraft Eyelet Labels , which were embellished with Gold Anchor and Starfish Charms. And Mini Walnut Clothespins were used to hold everything in place. The silverware was wrapped and rolled in coordinating cotton napkins. 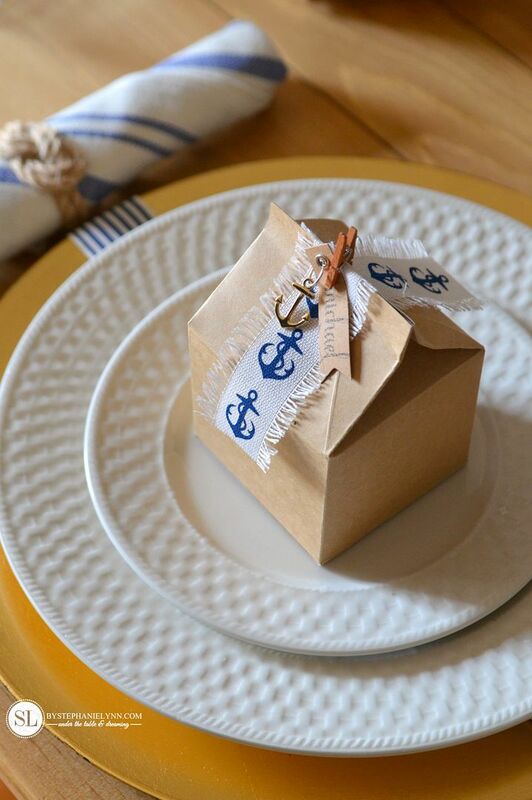 Keeping with our theme, pieces of Natural Jute Rope were tied in a nautical knot and served as the napkin rings. Instructions for the Double Figure 8 Knot can be found below. 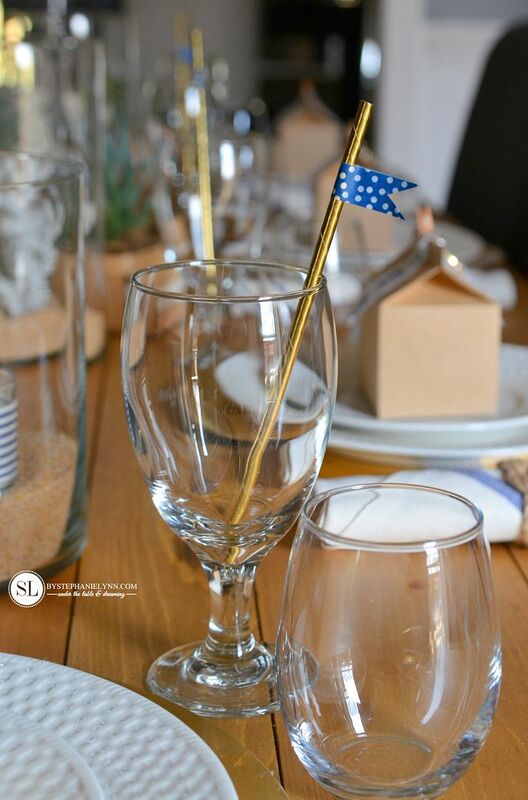 Navy Washi Tape was used to create pennant flags for the Gold Straws. The tape was simply cut into pieces, doubled over around the straw, and the ends cut to resemble a flag. 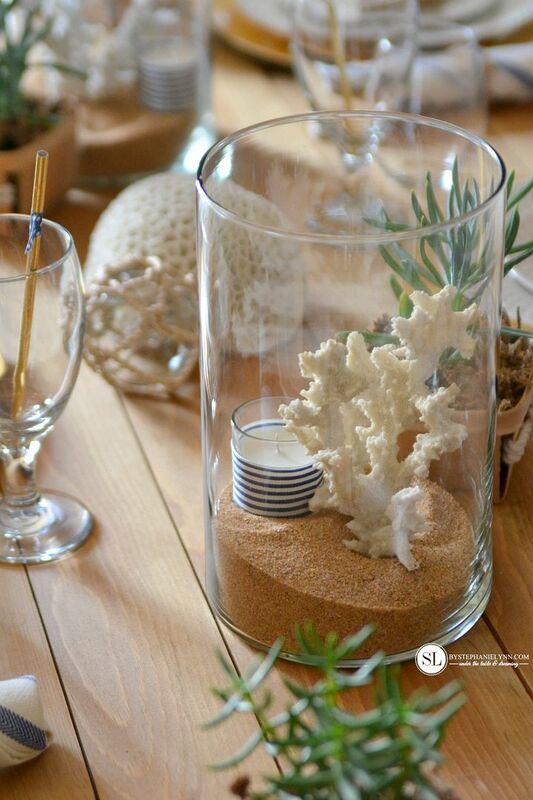 Two different centerpieces were used to line the center of the table. 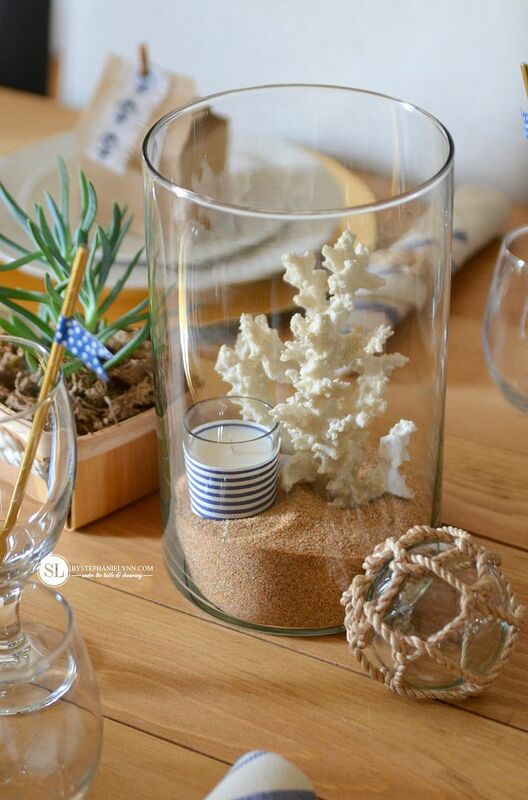 The first was a candle centerpiece that was created with simple Glass Cylinder Vases. 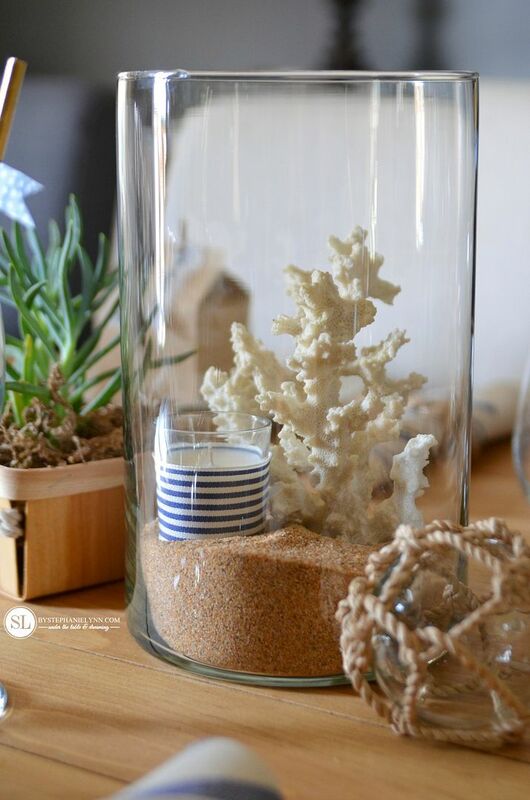 and can be filled to fit any theme or style of decor. 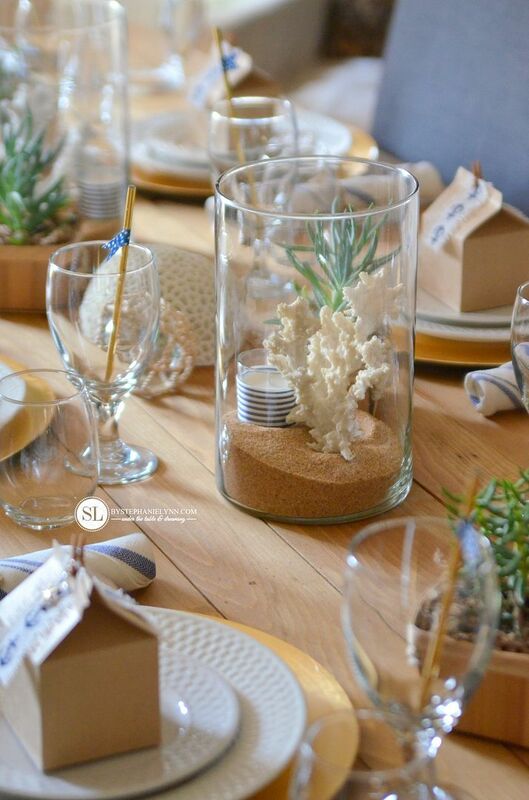 For this setting, each vase was filled with a bag of Tan Coarse Decorative Sand, a piece of decorative coral and Glass Votive Candles, wrapped with the same Navy Striped Ribbon used for the chargers. 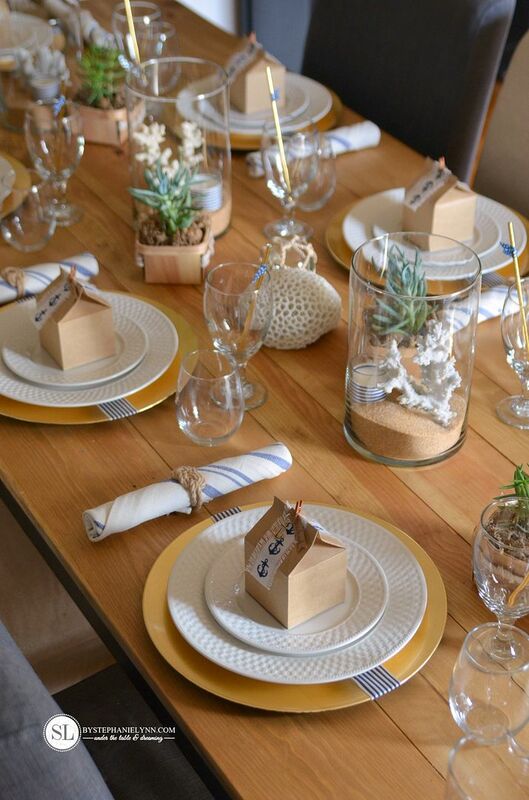 Succulents were used as the second centerpiece option. 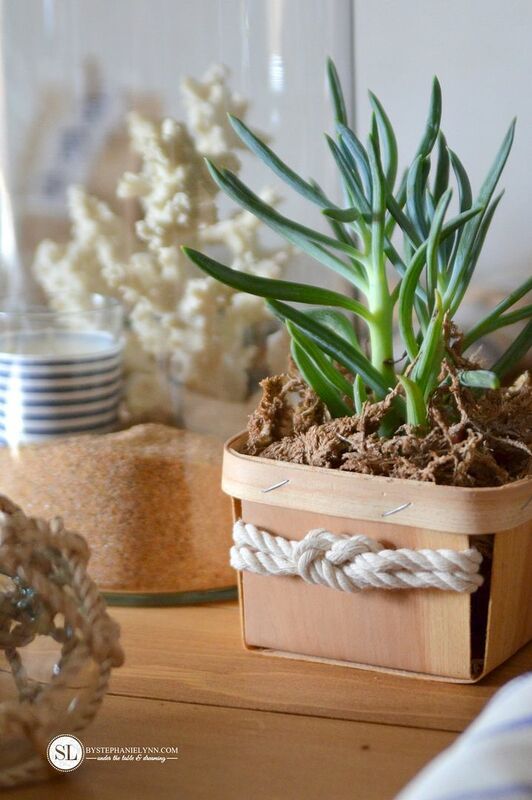 The potted plants seemed fitting for our theme and are a fresh take on cut florals. tucked in the top, to hide the containers. Each Berry Basket was embellished with square knots, which was tied with Cotton Rope. Instructions for the Square Knot are below. The ends were simply wrapped around the sides of baskets and hot glued to the inside. And of course we couldn’t forget the dessert. 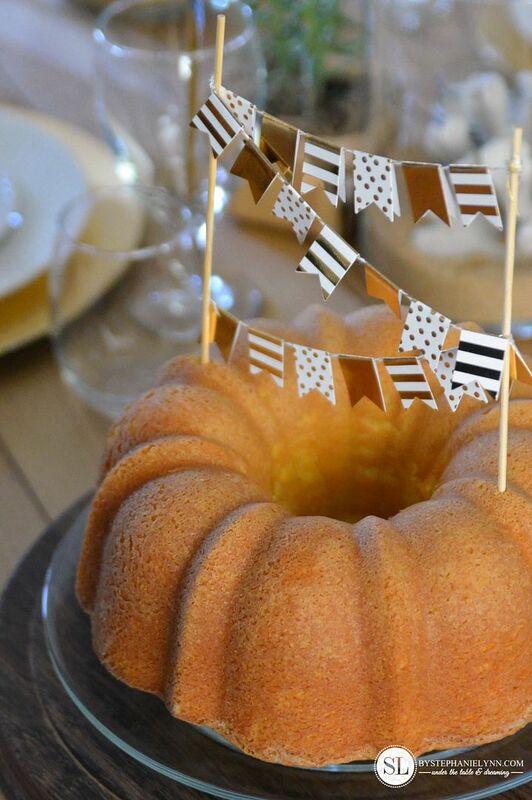 A simple lemon Pound Cake was made for the evening and dressed with an easy festive topper – created with a Gold Mini Pendant Banner and wooden skewers. 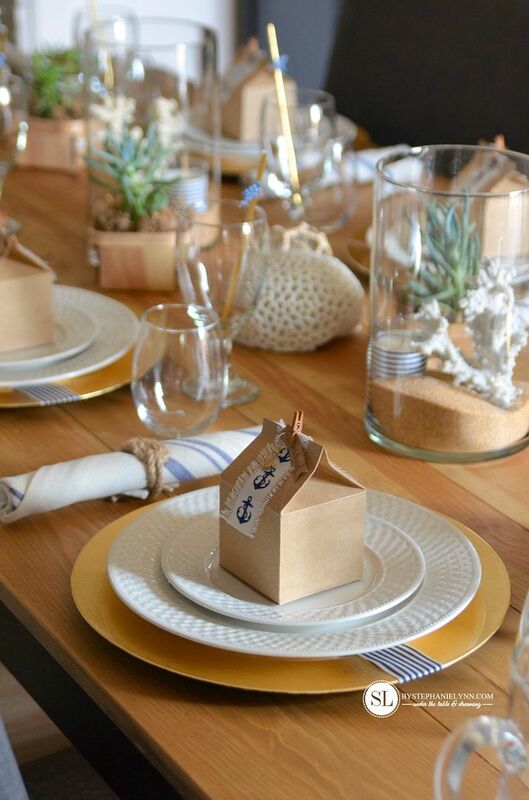 Hope you are inspired to add some style and charm to your next casual dinner party. 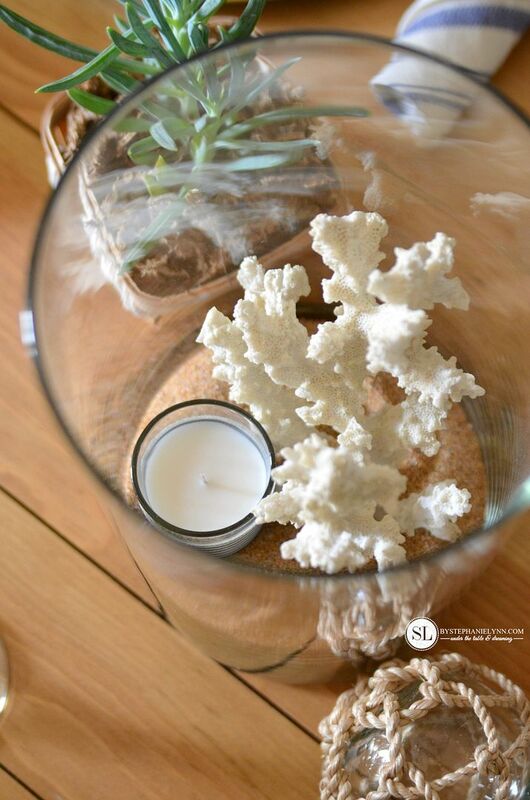 We put so much time and effort into making our homes a warm and welcoming place for our guests. 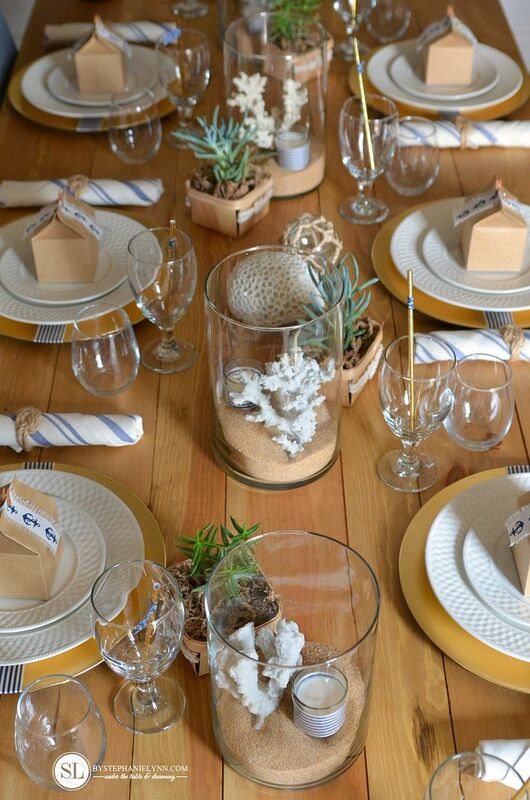 With a little planning and some easy crafting our table settings can reflect the same. This post is brought to you by Michaels . The opinions read here are entirely my own. Plan your next celebration with creative DIY projects using Michaels expanded assortment of Recollections™ Craft It™ party décor items. This assortment of paper crafting items is available in 15 different colors can be used to decorate occasion, from amazing party settings to casual events! Happy Entertaining!